Have you ever swiped your debit card and worried that you might not have enough money in your account? If this sounds like you, you might consider overdraft protection to save you from such a predicament. But is it worth it? Read on to learn all about overdraft protection and overdraft fees. In general, if you make a purchase with your debit card and don’t have enough funds in your account, the purchase won’t go through. This is typically called an overdraft — which is when you go below your account balance and dip into the negative territory. This situation can be awkward for you and the person behind the cash register. It also can be highly inconvenient if you need whatever you’re purchasing like now. This is where overdraft protection comes in. Overdraft protection essentially protects you from overdrafting. So, instead of getting your card declined and leading to an uncomfortable situation, your card will go through like normal – even if you don’t have enough money in your account to cover that purchase. But overdraft protection comes at a price, in the form of overdraft fees which can add up (more on that later). So, while overdraft protection, on the surface, can seem like a great solution to a temporary problem, it’s not all it’s cracked up to be. So, what does overdraft protection do? Overdraft protection is a safety net that helps you avoid overdrawing your account. In short, it’s a type of financial protection that will help float you money if you have insufficient funds. So if you swipe your debit card or try to get cash out of an ATM, you may be able to do so even if you technically don’t have enough money in your account. If interested in this protection, you’d want to talk to your bank and enroll in the program. Additionally, it’s important to know all the upfront costs such as overdraft fees, credit line limits, etc. The main pro of overdraft protection is convenience. Overdraft protection allows purchases to go through, even if you don’t have enough funds in your account. This can save you embarrassment, inconvenience and time. You don’t have to deal with your card getting declined in public or being unable to access cash when you really need it. How do I use my overdraft protection? If you want to use overdraft protection, first make sure it’s something you’re signed up for. As noted above, your bank must get consent from you first to enroll you in overdraft protection. Once you are enrolled, see if you have to link another account or a credit card to complete the process. Each bank may have different policies and procedures. When it’s set up, overdraft protection will be in place if you overdraw your account. But remember: The hope is that you never have to use it! If you do, this means you’ve run out of money in your account, which is no fun. Overdraft protection seems good in theory but it can cost you in the long run. The fees can vary from bank to bank and your financial institution can decide what to charge. And it’s not just one charge either. You can continue getting hit with overdraft fees if your account is overdrawn. We found that consumers can get hit with four to six overdraft fees per day. In some cases, that number can be as high as 12. What’s more: Consumers who frequently overdraft end up paying more fees than those who do not opt into overdraft protection. In fact, The Consumer Financial Protection Bureau (CFPB) found that frequent overdrafters who opt into this coverage pay nearly $450 more in fees. On top of that, if you accrue enough overdraft fees and stay in the negative, you’re at risk of your account being closed. Having your account closed by your bank is more than just a pain, but a major inconvenience on your financial life. Just think about all the bills that are connected to that account, or not having access to your money for a period of time. All of these are major cons of overdraft protection and should be considered carefully. Overdraft fees – by and large – are big business for many banks. In fact, the average overdraft fee is around $35. In 2017, consumers paid 34.3 billion dollars in overdraft fees in 2017, a number which has been on the rise since the Great Recession. Even credit unions, which are often thought of as more community-minded and consumer friendly have jumped on the overdraft fee bandwagon. Overdraft fees at credit unions have nearly doubled from $15 in 2000 to $29 in 2017. In short, overdraft fees are the bread and butter for many financial institutions. They give banks a way to make money off consumers by positioning overdraft protection as a useful service. What does overdraft protection mean for your credit? As noted above, in some cases your bank may offer you a line of credit or link your overdraft protection to a credit card. If linked to a credit card, you could end up paying more. Why? Because some card issuers might consider the overdraft a form of “cash advance,” which has its own set of fees, not to mention higher interest rates. Can you overdraft if you have no money? To get overdraft protection, your bank will typically connect a savings account and move over funds to cover the overdraft. If you don’t have any money in savings, the protection may not work. However, other banks have overdraft lines of credit. If eligible, the bank will loan you a line of credit so that your purchases are covered, even if you don’t have enough money in your account. Of course, you will still have to pay it back, with interest, like any other line of credit. Can you withdraw money from an ATM if you have a negative balance? If you’re headed to the ATM to get cash, and end up taking out more than you have in your account, you will overdraft. The overdraft definition means that you “overdraw” on your account, which means taking more than you have available. If you have overdraft protection, you will likely be able to withdraw money from your account and you’d have a negative balance. But of course, there will be an overdraft fee attached. So while you may get the cash you need, if you don’t have the funds in your account, it will cost more in the long-run. How can I avoid overdraft protection? Before 2010, many consumers were unaware that they were being “opted in” to overdraft protection programs. However, starting in 2010, federal regulations shifted and required that banks get consumers’ consent to opt into overdraft protection. To make things simple, however, you can avoid overdraft protection by not signing up for it with your bank. If you’re currently enrolled in this service, you can cancel it. This way, if you don’t have enough in your account, your purchase or transaction will get declined. While you won’t be able to make the purchase, you also won’t be hit you with an overdraft fee. Another option is to open a bank account at Chime, which has no overdraft fees. Lastly, to avoid this problem altogether, keep a buffer of money in your checking account. This can help you avoid dipping into the negative. Check your account balances daily and monitor your bill due dates and auto-drafts. This way you’ll know when money is coming out of your account. There are certainly pros and cons with overdraft protection. It can be convenient, yet costly. It can save you embarrassment and time, but also take a bite out of your hard-earned money. So, weigh these pros and cons carefully. Final tip: If you never want to worry about an overdraft fee again, consider switching to a no-fee bank account. By now you may have heard of Chime, a no-fee bank account that helps you manage your money on the go and save automatically. Pretty awesome, right? But did you know that Chime members also get a Chime Visa Debit Card, designed to help you save more money? Right about now you may be wondering how a debit card can help you save money. Plus, you might be thinking you don’t need another debit card as you already have a prepaid card or two in your wallet. You may also be wondering if there are any reloadable prepaid cards with no fees. But, once you learn more about the benefits of Chime, we think you’ll be trading in those prepaid cards for a brand new Chime debit card. What’s the difference between a debit card and prepaid card? Before we go any further, it’s important that you understand the main difference between these two types of cards. It boils down to this: A Chime debit card is linked to your bank account and a prepaid card is not. So, if you use your Chime debit card, your purchases are deducted from your Spending account. A prepaid card, on the other hand, is not connected to any bank account and it’s up to you to load money onto it in advance, according to the Consumer Financial Protection Bureau (CFPB). Typically, you can use your prepaid card until your loaded up funds run dry. To make it easier for you to understand other differences between Chime debit cards and prepaid cards, we took a closer look at four of the most popular prepaid cards: Netspend, RushCard, Brink’s and Bluebird by American Express. We then compared the Chime debit card to these prepaid cards in terms of five key categories: fees, mobile apps, ATMs, early direct deposit and security. Here’s what we found. Chime: Chime is a no fee debit card Plain and simple. This is important as the average U.S. household pays more than $329 in bank fees every year. Chime, however, is on a mission to change this with no overdraft fees, no monthly maintenance fees, no monthly service fees, no minimum balance fees, and no foreign transaction fees. In short, a Chime bank account is virtually free to use. Prepaid cards: Are there any reloadable prepaid cards with no fees? All of these four prepaid cards charge fees for certain services, including monthly fees, ATM withdrawals and transferring funds. To learn more about prepaid card fees – which can add up quickly – check out fee charts at Netspend, RushCard, Brink’s and Bluebird. Chime: The Chime app has 15,000 plus 5-star reviews. Whoa. Offering the best mobile banking experience, Chime’s award-winning mobile app helps you track your spending and savings, pay friends and relatives, transfer money, send and deposit checks, and pay bills. You can accomplish all of this from any smartphone. Prepaid cards: These cards all offer mobile apps that allow you to manage many financial tasks, like depositing checks, paying bills and viewing your transaction history. But, none of them offer extensive features like Automatic Savings or Pay Friends. Why? Prepaid cards are not bank accounts, which ultimately limits your overall banking experience. Chime: How does easy access to money sound? With a Chime account, you can use your debit card to get cash at more than 38,000 ATMs – for no fees. Period. Prepaid cards: With all four prepaid cards on our list, you can withdraw money from ATMs. However, there are fees involved. Here are the ATM fees using each of these cards: Netspend – $2.50 per domestic withdrawal; RushCard – $2.50 per out of network withdrawal; Brink’s – $2.50 per domestic withdrawal; Bluebird – no fees for MoneyPass withdrawals and $2.50 per non MoneyPass withdrawal. Chime: Chime members can get paid up to two days early with direct deposit, as well as automatically save 10% of every paycheck. That’s right. No more waiting for your money or worrying about lost paper checks. Chime gets you paid faster and helps you save money. Prepaid cards: All four of the prepaid cards also offer an early direct deposit option, allowing you to get your funds two days early. But unlike Chime, these cards are not tied into your savings account because, well, they aren’t bank accounts. You can instantly block your Chime debit card. This means that if your debit card is missing or stolen, you can block all transactions right from the app. Chime sends you real-time, instant transaction alerts. This way you can stay informed about your money at all times. You can shop worry-free at millions (yes, millions) of merchants. That’s because the Chime debit card is protected by the Visa Zero Liability Policy, which ensures that you won’t be responsible for unauthorized charges. Your privacy is important. And for this reason Chime requires two-factor authentication. Prepaid cards: These cards do offer some security features. For example, Brink’s allows you to add your picture to your card (but you’d expect this from Brink’s – brought to you by The Brink’s Company, a global leader in secure transportation and cash management). RushCard, in turn, offers One Touch Access, allowing you to use your fingerprint to access your account. And, because Bluebird is part of the Amex family, you’ll get purchase and fraud protection. But at the end of the day, none of these four prepaid cards are bank accounts and therefore do not offer the full scope of security features found at Chime. There are many differences between prepaid cards, and Chime. As you can see, Chime is not a prepaid card – far from it. Plus, the Chime debit card offers a lot more perks and benefits than prepaid cards. If you’re looking for a singular card that wins across all categories, Chime takes home the trophy. What are you waiting for? Sign up for a Chime account today and start saving money now. Sign up for a Chime Debit Card Today! The holiday season is approaching and you know what that means — spending money. Whether it’s buying gifts for loved ones or booking flights to travel home, the holiday season typically means a spike in spending for many of us. And, because you may spend more than at other times of the year, you’re probably going to use credit cards. But, did you know that while credit cards offer some cool rewards like cash back, using your debit card is often a wiser choice? Read on to learn why. Everyone wants to think they’re responsible with credit and only buy what they can afford. Well, a lot of people are wrong. According to a 2017 study by Magnify Money, 68 percent of consumers attributed their holiday debt to credit cards. Of the consumers surveyed, 44 percent racked up more than $1,000 and five percent accumulated more than $5,000 in credit card balances. More disturbing is the fact that half of those consumers noted that it will take more than three months to pay off the debt they accrued during the holidays. That’s more than a quarter of the entire year! When you use a debit card, however, you spend only what you have in your bank account. And, this helps you become more mindful and realistic about your budget. Using a debit card during the holiday season can also help you avoid fees and that dreaded holiday credit card debt. When you’re so busy, some of your normal day-to-day duties can fall to the wayside. And, if you don’t have auto-pay set up, you can potentially miss a credit card payment. Another common problem during the busy holiday season: You say you’ll “do it later” and then when you remember to pay your bill, it’s late. When you use a debit card, however, you don’t have to add anything else to your to-do list – including making yet another payment. The money comes straight from your bank account and you don’t have to do a thing. One of the biggest perks with using credit cards is the rewards, like cash-back and airline miles. But oftentime the best rewards cards come with an annual fee and the conversion on the rewards isn’t as great as you think. In many cases, miles are literally worth about a penny per mile or less. So, you may actually be spending your money on an annual fee, high interest rates, late fees, and more – without getting much in return. Here’s where debit cards take center stage. Debit cards are free and can help you avoid debt. At Chime, we’re all about helping you save money when you spend money. It’s all about balance. Am I right? With this in mind, check out Chime’s round-up savings program, where every time you use your debit card, we round-up the purchase to the nearest dollar and put it into your Savings Account. This way you can effortlessly save and know that you’re being financially responsible at the same time. There are no two ways about it: Fraud can be rampant during the holiday season. A lot of credit card enthusiasts think this is a solid reason to use credit over debit. But, your debit card can offer protections that are similar to your credit card. For example, if you suspect any fraudulent uses on your Chime card or your card goes missing, you can simply go into the app and immediately put a halt on purchases by disabling transactions. No need to stay on a long customer service line (who wants to talk on the phone?!) and no need for lengthy emails. Just put a stop to it, now. Not only that, but Chime alerts you any time you use your debit card. So, if your debit card get into the wrong hands, you’ll know right away. The holiday season should be a time of joy and fun, not stress and debt. Using debit instead of credit can help you keep your spending in check, plus you’ll have one less thing to worry about. So, this holiday season: Try spending only what you have and enjoy the season with family and friends. It sure beats worrying about money! Everyone has different methods of managing their finances. Some people swear by the cash envelope system, while others put everything on credit cards with the aim of paying them off in full each month. Yet, perhaps the most underrated way to stay on budget is to use a debit card that links directly to your savings account. This way you can readily keep tabs on your daily spending as your purchases come right out of your bank account. According to Nasdaq, banking institutions in the United States issue over 165 million debit cards each year. So, you likely already have a debit card and this may become your best friend when it comes to controlling your spending. Here are 5 reasons why debit cards can help you stick to your budget. Perhaps one of the biggest advantages of using plastic versus cash is that you can easily track your spending without having to carry around wads of dollar bills. Every time you swipe your debit card, your transaction is tracked. When you go to view your bank account online or your monthly bank statement, you can see just how much money you spent, and where. While you may not be able to easily discern exactly what you bought (that’s when you can look at your receipt), keeping tabs on your bank account debit transactions provides a good starting point to figure out where you are potentially spending too much money. Credit cards impose a “credit limit” on consumers. This is the limit on how much you can borrow on your credit card. Your credit limit is determined based on a number of factors, including your credit score and credit history. And, oftentimes credit card users spend more money than they can afford to pay off each month. When this happens, you’ll get charged interest. Interest is the money credit card companies charge you for carrying over a balance from month to month. With the average credit card interest rate of 16.71 percent, it can be easy to get stuck in the cycle of debt. With debit cards, your “debit limit” is the amount of money you have in your bank account. If you don’t have the money available, well, you won’t be able to spend it. This may not sound like much fun, but it will certainly help you avoid the same type of spending sprees that often occur with credit cards. On the other end of the spectrum, cash budgets are preferred by many people who don’t feel like they can keep a handle on credit card spending. Yet cash comes with its own set of problems. For example, the cash envelope system is a popular way of budgeting, but it requires you to have a significant amount of cash on you at all times. Here’s how this type of budget works: you stash cash in individual envelopes for each area of spending, such as groceries, gas, fun money and clothing. You only put as much cash into each envelope as you have budgeted for that particular category each month. Once you are out of money, you’re out. Indeed walking around with envelopes of cash to pay for things is enough to make anyone sweat, as you may worry about losing your money or having your purse or wallet stolen. Once your cash is gone, it’s gone. Counting your actual dollars and cents takes a fair amount of time when you’re standing at the register in a store. Debit cards, on the other hand, are convenient and transactions are quick to process when you’re making a purchase. Finally, if you prefer to use budgeting apps to keep track of your finances, your debit card may be the perfect solution for you. It’s impossible to sync a cash-only budget to an app. You need to have a budgeting app linked to a credit or a debit card in order for it to automatically update. While debit cards can’t list out every single individual purchase you make, they can connect to budgeting apps that can help you distinguish where your money is going. Digital apps take the grunt work out of budgeting. Instead of having to track every individual expense, you can let an app do the work for you, saving you a ton of time and effort. Should you use a debit card for budgeting? Depending on your spending habits and preferences, a debit card may be a great way to help you stick to your budget. You may be surprised at how much money you can save by simply tracking your spending using the debit card you most likely already have in your wallet. It certainly doesn’t hurt to give it a try, right? Some people use personal finance terms interchangeably like ‘checking account’ and ‘bank account’ or ‘interest rate’ and ‘APR’. In these instances, this is understandable. Yet, when it comes to prepaid, debit and credit cards, it’s important to note that these cards are not the same thing. While they all may show a network logo like Visa, MasterCard, American Express, or Discover, these three types of cards are actually quite different. With that said, these cards do have one thing in common: if you’re not using cash, you’re likely using one of them to make your purchases. Read on to learn more about the differences between prepaid cards, debit cards and credit cards. A debit card is linked to your checking account through your bank. When you use your card to make an in-store or online purchase, the money gets deducted from your bank account. You can also use your card at an ATM to withdraw cash. If you happen to spend more than the amount in your account, you may be charged an overdraft fee. Chime Bank provides one of the few debit card options that doesn’t have overdraft fees. Chime also offers fee-free ATM withdrawals at all MoneyPass ATMs. Be mindful that some loading methods may come with a small fee. There are different types of prepaid cards to choose from: free prepaid debit cards, reloadable prepaid cards with no fees, and no limit prepaid debit cards, to name a few. Make sure you understand the terms and limits of this type of card before you use one. A credit card allows you to make purchases by borrowing from a credit limit instead of using the money you have in your checking account or funds you loaded onto a prepaid card. With a credit card, you’ll have a minimum amount that you are required to pay each month (reflected on your bill), but it’s a wise idea to try to pay off the entire balance if possible. It’s also important to note that you’ll receive a certain limit when approved for a card. You can then spend up to this amount regularly so long as you make your minimum payments on time. For example, if you get a credit card with a $1,000 limit, this means you can spend up to $1,000 on the card. While you can carry your remaining balance over to the next month, you will be charged interest on the balance until you pay it off. This is why it’s recommended to purchase only what you can afford to pay for within a short period of time – preferably during that same billing period. A good rule of thumb is to only borrow up to 30% of your credit limit and try to pay the bill off in full each month. So, instead of spending your entire $1,000 credit, you may want to spend $300 or less and pay the bill off in full at the end of the monthly billing cycle. According to Experian, this is called credit card utilization and it’s a common factor when determining your credit score. Credit cards can help you build your credit and demonstrate that you are a trustworthy borrower. In fact, credit card companies report your borrowing and payment history to the three major credit bureaus and this helps shape your credit score. One final note about credit cards: when you decide to apply for one, make sure you understand all the fees and terms. As you can see, there are quite a few key differences between the three cards above, so let’s discuss them in more detail. Benefits of the prepaid card. A prepaid card is different from a debit card based on the fact that you don’t need a bank account to have a prepaid card. And, when you get a prepaid card you won’t be subject to any credit checks or inquiries into your banking history because you are using loading your cash onto the card. Another perk: you may be able to deposit your paycheck right onto your prepaid card. But that prepaid card may not be so safe to use. While prepaid cards can look and feel like debit cards, they aren’t as safe as debit cards. Why? Since debit cards are connected to your checking account, you can easily monitor your account and spending online for free. Your money will also generally be protected if your debit card gets lost, stolen, or wrongfully charged. However, the Consumer Financial Protection Bureau (CFPU) has put new rules in place to make prepaid cards safer for consumers. These new rules are set to go into effect on April 1, 2019. Now let’s talk about credit cards vs. debit cards. Credit cards are different from both prepaid and debit cards due to the fact that when you use a credit card you are borrowing money while hopefully building a solid credit history. Better yet, many credit cards offer rewards in the form of points or cash back that can be redeemed for statement credits, travel, or merchandise. Some people like to use credit cards to purchase groceries, gas, and other everyday needs in order to rack up reward points. As long as you’re not overspending and can pay your bill off in full each month, there’s nothing wrong with using this strategy. However, if you struggle with controlling your spending, you may want to steer clear of using credit cards for your daily purchases. Instead of credit cards, consumers often choose debit cards for everyday spending. Why? Debit is safer than cash, you can monitor your activity online with mobile banking, and you can choose a bank that doesn’t have fees. If you’re not going to be using cash 100% of the time, odds are you’ll need one of these three cards. Some people start with a prepaid card, but most choose a debit card that’s connected to a checking account for easy access to their money. Still others prefer a credit card, especially if it offers perks and rewards. You can choose to use more than one card! We’ll leave you with this thought: you may want to consider using two or all three of these cards for different types of spending. The bottom line: the best option is the card that works best for your spending and lifestyle habits. Let’s face it — managing your money isn’t something that you’re taught in school (but learning about isosceles triangles sure came in handy.) Yet, learning how to manage finances is key to proper adulting. Indeed, the best way to manage money can seem like a process of trial and error. But here’s a secret: using the right tools can make it much easier. That’s right. There are financial tools out there that can help you learn how to manage money and simplify the whole process. Where should you start? With your bank. You may not realize it but your bank account is part of the foundation of your financial life. If your bank isn’t helping you manage your money, you can feel lost at sea. But with the right bank account app? You can get on the path of financial freedom and be the boss of your money. Perhaps the best example of this is with Chime Bank. So, let’s dive in and find out how the Chime bank account app can help you manage your money. It’s time to take control of your financial life and make money moves that will benefit you now and in the future. Unfortunately, traditional banks make going to the bank seem like a pain. You may not like going to in-person branches, waiting in lines and dealing with tellers that treat you like a number. And, while traditional banks may have online banking apps, many of them are clunky and not very user-friendly. When it comes to online banking apps, you’ll want to look for one that’s flexible, convenient and accessible. It’s also important that the app is intuitive and just makes sense. Chime’s online banking app fits the bill. It’s easy to use and works with your lifestyle so you can take control of your financial life. Some other perks: you can cash checks on the go and easily transfer money from your Spending Account to your Savings Account. Plus, if you’re out to dinner and need to pay back a friend, you can easily transfer money to that friend using the Chime banking app. Chime can help you stay on top of your financial life and make managing your money easier and convenient. No more bank visits, frustrating online apps or confusing websites. Chime has one of the best mobile banking apps, giving you the power to take charge of your money. Wondering how to manage money? The first step is knowing where your money is going. But tracking can be tedious. Using the Chime mobile wallet, you know where you stand with your money at all times and where your cash is going. You can get instant transaction alerts when you use your debit card. Not only that, but Chime sends you daily updates on your bank account balance. So there will be no “OH MY GOSH how did my bank account balance get so low? !” moments. You won’t be left in the dark. Perhaps the most annoying little expense is a hidden fee that you didn’t know about. This includes monthly maintenance fees from traditional banks — like, aren’t they supposed to maintain your account anyway regardless of how much is in your account? Isn’t that a bank’s job? But at traditional banks, fees are everywhere. From monthly maintenance fees to overdraft fees, to ATM fees and foreign transaction fees. All of those fees can add up and cost you. In fact, the average household in the U.S. pays an astonishing $329 in bank fees every year. When you’re trying to get your money right, you need to keep all the coins you can. Keep in mind: you’re the one trying to pay down your student loans, get out of credit card debt and save for that trip to Aruba you’ve been dreaming about. With Chime online mobile banking, you can ditch fees forever. Seriously. No fees. No surprises. You can take that money and put it toward debt, savings, or something fun just for yourself. All of that money adds up and can make a difference. What’s your favorite day? When asked that question, most people would say “payday.” There’s something exhilarating and calming about knowing that money is hitting your bank account. It’s your reward for your hard work and a job well done. And, it also helps you pay your bills. Imagine if you could get paid two days before payday. How exciting would that be? What could that do for your cash flow, your ability to pay bills faster and save more money? At Chime, we know the benefit of getting paid early. This is why we’ve created Early Direct Deposit. When you sign up for this option, you can get paid up to two days before your payday. Your funds won’t be held hostage and you won’t have to deal with pesky physical checks. Getting your money early can help you take action on your financial goals. Pay bills. Save money. Spend on the stuff that matters to you most. All without waiting for the money that you earned. Sounds like a win, right? You want to save for a rainy day. Save for your future. Save for your friend’s wedding next summer. Save for a ticket to Burning Man. It can all seem so overwhelming if you’re trying to figure out how to manage finances. Using Chime’s online mobile banking app, you can save easily and effortlessly for everything you want. We have a Save When You Spend feature which rounds up your transactions to the nearest dollar and transfers that money from your Spending Account to your Savings Account. So, if you go out for coffee and get a cappuccino for $3.75, that figure will be rounded up to $4 and twenty five cents will be transferred to your Savings Account. While that may not seem like a lot, your collective transactions add up and you’ll save a good chunk of change before you know it. On top of that, you can automatically save 10 percent of each paycheck with Chime. This way, when you get paid, you know you’re already saving money without extra work on your part. Boom. Savings just got easier. Your goals just got closer. If you lose your debit card it can be quite scary. After all, your card links straight to your checking account and this is where your money is housed. So, what can you do if you lose your debit card or it gets into the wrong hands? Instead of waiting in a long line to talk to a customer service rep and answer a million questions, you can use the Chime app and put a halt to your transactions immediately. Simply open your Chime bank account app and block transactions on your debit card. This will prevent any new transactions or withdrawals from your account. Additionally, Chime has a Zero Liability policy so you won’t be held responsible for any unauthorized charges. In an environment ripe for data breaches and identity theft, being protected is crucial. We take an extra security measure and require two-factor authentication and also have fingerprint authentication. Ready to finally learn how to manage your money? A bank account like Chime and it’s mobile wallet features can help you both manage your money and reach your financial goals. Life is more than just paying bills and working. 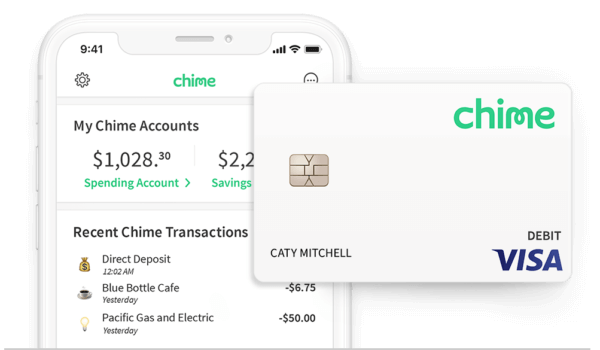 With one of the best mobile banking apps on the market, Chime aims to make managing your money simple and even, well, fun. Isn’t it time you lived a less stressful life? Overdraft fees are a wolf in sheep’s clothing. While a bank often markets overdraft protection as a way to help you out when you make an occasional budgeting error, it’s really just an expensive form of credit. Think about it: in 2014, the Consumer Financial Protection Bureau (CFPB) found that the majority of overdraft fees were charged on transactions of $24 or less. With a median fee of $34 at the time, the same type of charge on a loan for a similar three day period would result in an annual percentage rate (APR) of 17,000%. How did we get to this point? And what can you do about overdraft fees? Read on to learn more. An overdraft occurs when you’ve written a check, taken a cash withdrawal or used your debit card in an amount that exceeds your available funds. Most banks and credit unions offer overdraft protection, and this covers your shortfall in exchange for a fee. But, let’s now think about this in terms of modern times. In 2017 alone, consumers paid $34.3 billion in overdraft fees, according to PYMTS.com. So, it’s possible that if Hume knew what would become of the cash credit idea, he may have changed his tune. It’s unclear exactly when banks started charging overdraft fees. But according to Moebs Services, a research firm that focuses on financial institutions, these fees have steadily increased over time. In 2000, for instance, the median overdraft fee was $20 among banks and $15 at credit unions. In 2017, those fees increased to $30 and $29, respectively. That said, some of the biggest banks in the U.S. charge between $34 and $36. While there are still some institutions that don’t charge fees on overdrafts of less than five dollars, this is not a universal feature. Also, some institutions charge extended overdraft protection, which adds more fees if you don’t bring your balance back to zero within a certain period. These time periods can range from one day to a week. While overdraft fees are ubiquitous, it’s possible that you’ll never have to deal with them. For starters, you can budget your money in a way that you never overdraw your account. And, if you make a mistake, you can also get your account back in the black before the end of the business day. In 2009, the Federal Reserve Board announced a new rule prohibiting financial institutions from charging overdraft fees on ATM and one-time debit card transactions unless the customer opts in for overdraft protection on these transactions. The rule, which was made under Regulation E, went into effect in July 2010. Yet, according to a 2017 study by The Pew Charitable Trusts, nearly three-quarters of people who overdraft don’t know they have the right to opt out. Guess what? You can opt out! By doing so, any transaction that overdraws your account will simply be declined. This may not be ideal in some situations. For example, a credit card company may charge you a returned payment fee if a payment doesn’t go through due to an insufficient balance. For other transaction types, however, the only negative impact from a declined payment may be an embarrassment. Rather than charging a flat fee every time you overdraw your account, some banks offer less punitive forms of overdraft protection. For example, some banks set up automatic withdrawals from a savings account to cover overdrafts. Let’s say you overdraw your account on a Monday morning and your account is still negative at midnight. Instead of charging you an overdraft fee, the bank will transfer cash from your savings account to cover the negative amount. Another option is an overdraft line of credit. Again, instead of charging you a flat fee, the bank charges you interest — say 18% — on the negative balance. While this might seem high, if you overdraw $24 and bring your account back to positive within a few days, the accrued interest amounts to pennies. With the rise of challenger banks, many new institutions have addressed some of the major issues with the traditional banking system, including the problem of overdraft fees. If you open an account with Chime, for example, you’ll never pay overdraft fees. Period. This means you don’t have to find some other way to avoid the problem because there’s no problem to begin with. Overdrafts have been around for a long time, but the penalties keep getting worse. The good news is that there are plenty of ways to avoid overdraft fees, and some financial institutions don’t charge them at all. If you’ve paid an overdraft fee recently, it may be a good time to look into alternatives at your bank or switch banks altogether. What are Prepaid Bank Cards? If you don’t have an online bank account or credit card and want an easy way to limit overspending, a prepaid card may be your best bet. Millions of Americans are using them to supplement or replace traditional banking services. Yet, prepaid cards also have their drawbacks. Here’s the scoop on prepaid debit cards. This way, you’ll be in the know when it comes to making the best choices for your finances and goals. A prepaid debit card is exactly what it sounds like. It is an alternative banking card that only lets you spend the money that you have preloaded onto the card. You can use your prepaid card anywhere that accepts its payment network, such as Mastercard or Visa. If you attempt a purchase beyond the funds available, your card is simply declined. When you’ve exhausted the funds on your card, companies offer you multiple ways to add more money. Depending on the provider, you can add cash via a transfer, direct deposit or cash. A quick internet search can reveal what banks offer prepaid debit cards and options for the best-prepaid debit cards. Unlike a traditional debit or credit card, a prepaid card requires that you pay before you go to make a purchase. You do this by loading up your card with cash ahead of time. A debit card, on the other hand, charges you immediately after you make a purchase by deducting that amount from your bank account. And, a credit card doesn’t require you to pay until after you buy something – whenever your next bill is due or over time (you’ll typically incur interest if you don’t pay off your entire balance that month). Who can benefit from a prepaid card? Prepaid cards are easy to get and very useful if you’re prone to overspending. You can qualify for a prepaid card regardless of your credit history. And, they are helpful if you’re trying to avoid debt. Because of these benefits, these cards are often a good option if you don’t have access to a credit card or you’re trying to budget using mainly cash. At the same time, a pin-protected prepaid card is safer than carrying cash. Prepaid cards can also be helpful if you don’t have access to a bank account. With this said, keep in mind that with the rise of challenger banks, more people can now get bank accounts. What are the disadvantages of prepaid debit cards? While many turn to prepaid cards for convenience, these cards have some significant limitations. In fact, prepaid cards have a bit of a bad rap and the Consumer Financial Protection Bureau will be rolling out new regulations for prepaid cards in May of 2019. The most important disadvantage is that prepaid cards charge a lot of fees. For example, you’ll often be charged fees for an initial setup, monthly maintenance, reloading your card, ATM use, and more. Studies have shown average prepaid cardholder fees total $11.00 per month. In short, there are no free prepaid debit cards. If you have bad credit, keep in mind that these cards also won’t help you rebuild your credit. And, you won’t have access to banking services or the ability to stop payments. Also, prepaid cards don’t offer fraud protection like a typical debit or credit card. If your card is stolen, there is no requirement for the issuer to replace the funds. Even with the roll-out of the new CFPB rules next year, prepaid cards that aren’t registered with your name and personal information won’t be required to offer this protection. Banking options such as Chime provide a great alternative to prepaid cards and allow you to open a bank account with bad credit and require no deposit. What are the best alternatives to a prepaid debit card? If you are turning to a prepaid card because you’re having trouble getting a credit card, want to avoid credit card interest and don’t want to ever pay overdraft fees, you do have other options. First off, consider an online bank account such as Chime. Chime is a mobile bank account with no hidden fees. You’ll receive a debit card with free access to over 30,000 ATMs. With Chime, you can get paid up to two days early with direct deposit. You’ll also be able to use your card at any merchant where Visa is accepted. With no minimum balance requirements, overdraft fees, or monthly fees, you can get the benefits and protections of a bank without all the costs. Apply For a Chime Online Bank Account Today! Secondly, if you want to build credit, consider a secured credit card as a stepping stone. These cards help establish or rebuild credit history without living beyond your means. The amount of cash you deposit as collateral becomes your credit limit. For example, if you put $500 on a secured credit card, that’s how much you can spend. It differs from a prepaid card as your charges don’t draw directly on your cash deposit, but on a credit line that you need to pay off regularly. Whether you’re considering a prepaid card as a budgeting tool or alternative way to bank, be sure to dig into all the fees before choosing a card. And remember: prepaid cards can be expensive to use, so you’ll want to know the costs before committing to a card.